Opening on 6 October 2011, Thursday, 6 pm. Artist talk on 22 October, Saturday, 4 pm. Exhibition runs until 27 October. A prequel to Claro Ramirez’s offering for the upcoming 2011 Jakarta Biennale, Wanted: Tubero features an initially minimal installation of television monitors connected with PVC pipes. During the exhibition opening and throughout the show’s run, visitors will be invited to adjoin to the installation through available pipes which may be connected to the existing work. Wanted: Tubero, particularly within the arts, emphasizes the importance of engagement, participation and community. Ideas that are reflected as well in the monitors' content, the televisions play videos of other artists’ work as well as Ramirez’s own. The process of audience involvement in the installation will also be documented to eventually become a part of the evolving work. Wanted: Tubero is the 10th solo exhibition of Claro “Chitz” Ramirez, who practices both as an artist and curator. A recipient of the Thirteen Artists Award in 2000, Ramirez’s works are often site-specific installations, attached to the exhibition space, context and audience. With the latter, he gives particular value to reception, connection and interactivity. Having studied Commercial Arts in the University of Santo Tomas and Fine Arts in the University of the Philippines, Ramirez held his first solo show in 1996 and has been exhibiting his video installations since 2002. From 2005, he has also been acting as consultant for Lopez Memorial Museum in artistic direction and in multimedia exhibitions. 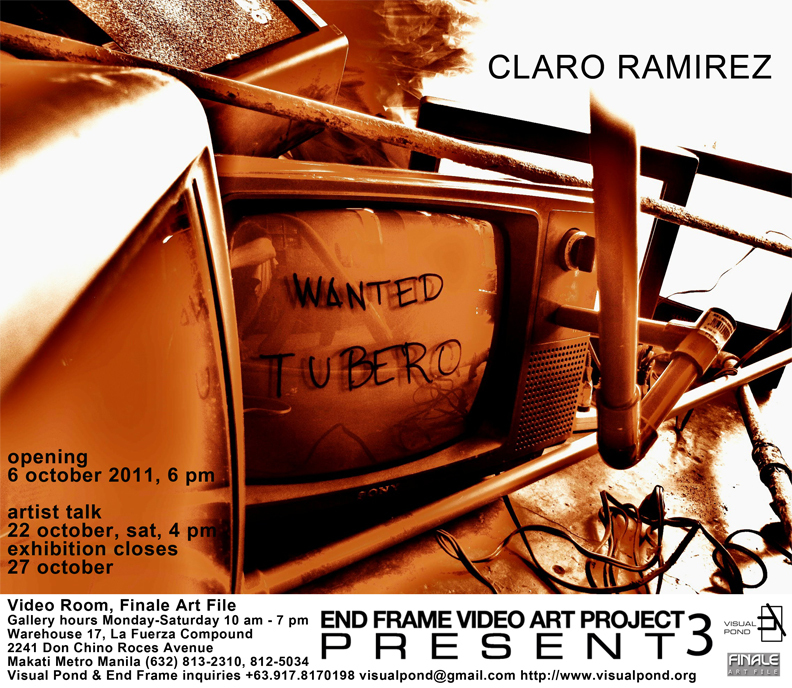 Ramirez’s Wanted: Tubero is the third offering of End Frame Video Art Project 3, a project of the non-profit organization Visual Pond. Throughout the Philippine video art festival, artists stage a solo show presenting new video work in various venues from 2011 to 2012. Curated by Clarissa Chikiamco, the theme of the third edition, Present, refers to the current project’s focus on the video art practices of selected Philippine contemporary artists. Ramirez’s exhibition follows the End Frame 3 shows of Tad Ermitaño and Manny Montelibano and will be followed by the exhibitions of Kiri Dalena, Yason Banal, Kaloy Olavides and Maria Taniguchi. The show opens at the Video Room of Finale Art File on 6 October 2011, Thursday, at 6 pm. An artist talk will be held at 4 pm on 22 October, Saturday, and the exhibition runs until 27 October 2011. Finale Art File gallery hours are Monday to Saturday, 10 am to 7 pm. Finale is located at Warehouse 17, La Fuerza Compound, 2241 Don Chino Roces Avenue, Makati Metro Manila with telephone number (632) 813-2310, 812-5034. For more on Visual Pond projects and End Frame 3, visit http://www.visualpond.org or call Rica Estrada at +63917-8170198 or email visualpond@gmail.com.